On the cover: Calving, 2014 Oil on linen 48 x 60 in. Beneath, 2014 Oil on linen 60 x 80 in. Kathryn Markel Fine Arts is pleased to present Water Stories, Anne Neely’s first solo show with the gallery, which was first exhibited at the Museum of Science, Boston, in 2014. The inspiration for Anne Neely’s current body of work began in 2004 after she read Marq de Villier’s Water, The Fate of Our Most Precious Resource. Her awareness of the global water issues led her to research droughts, water mining, depleted aquifers, climate change, pollution, contamination, overuse and mismanagement of water. The more she discovered, the further her concern for water preservation seeped into her paintings. Anne Neely is a painter foremost. Her work is centered on the process of painting as much as it is with the ideas they express. 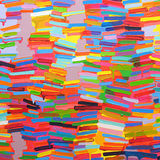 She works in abstraction, referencing nature and forming emotive images. She has created a language out of circles, squares and rectangles, which she uses to articulate mood and feeling. Neely’s concern for water has deepened her sense of purpose, transforming her paintings into curiosity-inducing scenarios often depicting imaginary water-scapes. Some of the paintings contain cross-sections of ground water and aquifers that move in and out of multiple points of view. Neely begins each of her paintings by pouring washes of paint over stretched linen. She then builds the surface with a series of marks, more layers of washes or drips of varying opacity, honing the depth and complexity of both the image and the subject. They strike a dynamic balance between spontaneity and intention, encouraging the viewer to make visceral connections. Although these paintings are never a specific place, they do convey specific ideas. They dazzle with their rich surfaces but reveal a sense of foreboding, enhanced by the imposing presence of the large-scale works. They remind us that we are in danger of losing our most precious resource. National Geographic Society Freshwater Fellow Sandra Postel says, “She conjures the mystery and magic of water, but also confronts us with its seemingly discordant duality: floods and droughts, harmony and conflict, life and death. Each of us is about two-thirds water. 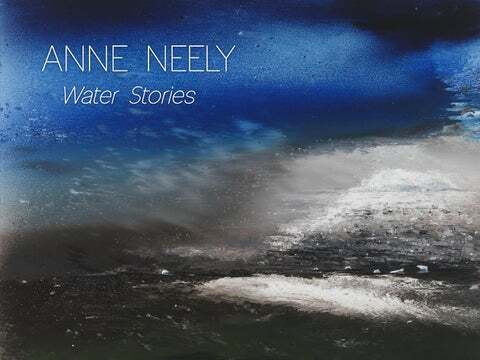 Anne’s water stories are our stories.” Anne Neely’s work has been the subject of more than twenty solo gallery and museum exhibitions in Boston, New York, San Francisco, and Ireland. Her work is included in the collections of the Whitney Museum, the National Gallery of Art, the Smithsonian Institution, the Brooklyn Museum, the DeCordova Sculpture Park and Museum, and the Museum of Fine Arts, Boston. Neely lives in Jonesport, Maine, and Dorchester, Massachusetts. She taught at Milton Academy where she held the Lamont Teaching Chair in the Humanities. Bloom, 2014 Oil on linen 60 x 80 in. Gush, 2014 Oil on linen 48 x 60 in. Calving, 2014 Oil on linen 48 x 60 in. Lost, 2014 Oil on linen 56 x 72 in. Run Off, 2014 Oil on linen 60 x 80 in. Offshore, 2014 Oil on linen 70 x 92 in. Splash, 2014 Oil on linen 60 x 80 in. Squall, 2014 Oil on linen 60 x 80 in. Troubled Waters, 2014 Oil on linen 52 x 60 in.